DENIS (DIONYSIUS), RUSTICUS, and ELEUTHERIUS, St. Denis has for many years been regarded as the patron saint of France. According to St. Gregory of Tours (17th November), he was sent to preach the Gospel at Lutetia Parisiorum (present-day Paris) in Gaul circa 250. There he served as the first Bishop of Paris. He was beheaded with the priest Rusticus and the deacon Eleutherius at Montmartre (Hill of the Martyrs) circa 258. The Abbey of Saint-Denis, where French kings were interred, was built on the site of their martyrdom. According to a later legend, St. Denis carried his severed head from Montmartre to his burial place at Vicus Catulliacus, the present Parisian suburb of St. Denis. DEUSDEDIT, the fifteenth Abbot of Monte Cassino, a man of great learning and holiness of life, who was especially renowned for his almsgiving. St. Deusdedit was kidnapped, and attempts were made to extort money in exchange for his release, however, he was subject to torture during his captivity resulting in his repose in 836. St. Deusdedit was subsequently venerated as a martyr. DOMNINUS (DONNINO), a native of Parma who, according to tradition, was a chamberlain in Emperor Maximian Herculeus (r. 286–305) Milanese court and a secret convert to Christianity. When Maximian discovered the conversion, he ordered St. Domninus’ arrest. However, St. Domninus fled heading towards Rome, but was captured and beheaded on the Via Claudia in 304. GEMINUS, patron saint of San Gemini in Umbria. He reposed circa 815. GHISLAIN (GISLENUS, GUISLAIN), an anchorite who lived in the forest in Hainault, near present-day Mons in Belgium. As disciples gathered around him St. Ghislain built the monastery of SS. Peter and Paul, now Saint-Ghislain, where he served as abbot for about thirty-five years before reposing circa 680. GUNTHER, Duke of Thuringia, and related to several of central European royal families, and until the age of fifty, St. Gunther enjoyed a worldly life as a member of Court. Then in 1005, he was brought to repentance by St. Godehard of Hildesheim (4th May) and in penance for his heretofore misspent life, resolved to enter monastic life. For this reason, the following year, St. Gunther, following a pilgrimage to Rome, received monastic tonsure at Niederaltaich Abbey in Bavaria. However, his pride and worldly ambition soon reared its head and St. Gunther, against the counsel of St. Godehard, insisted on becoming Abbot of Göllingen Abbey in North Thüringen, which St. Gunther had endowed and retained ownership of. Needless to say, as a novice in the monastic life, he was not successful in this role, and in humility went to live as a hermit in the Bavarian Forest near the Czech border about 100 km (60 miles) east of Regensburg. In time, a community grew around him which became the Rinchnach Priory, a dependency of Niederaltaich. St. Gunther reposed at Hartmanitz (present-day Hartmanice in the Czech Republic) 1045. LAMBERT and VALERIUS (BELLÈRE, BERIHER), disciples of St. Ghislain (vide supra) in Hainault near Mons in present-day Belgium. They reposed circa 680. 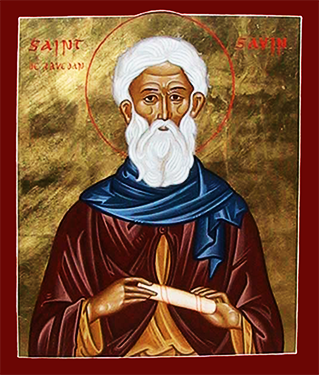 SABINUS (SAVIN), a hermit who is also known as the Apostle of the Lavedan. According to tradition, St. Sabinus was a native of Barcelona, educated at Poitiers and received monastic tonsure at Abbey of St. Martin of Ligugé in Vienne. He is believed to have reposed circa 820.